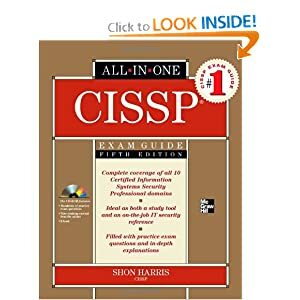 Here you will find a more comprehensive list of CISSP resources (most are mentioned throughout this blog) with my reviews. Most of this stuff is outlined here. I will continue to update this page as I find new resources that I have found useful. Look for a review of an online, self-paced boot camp soon (thanks bossman)! by Eric Cole – These lectures I liked VERY much. There are also slides that go along with the audio. Eric Cole has a very nice voice (literally-NY accent) and explains thing extremely well. He considers the novice and the expert. He gives excellent advice on taking the exam and explains what to expect on the exam. The lectures were recorded at a week-long convention in Vegas and at times he talks way too much about other things that are going on outside of his lectures. The guy is very easy and entertaining to listen to. These are awesome lectures! 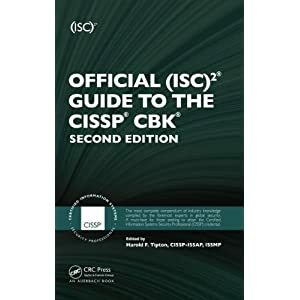 Practice test questions from (ISC)2 I still have mixed feelings on these questions. If you can get someone else (boss, company, etc) to pay the $300 for 300 questions great, if not don’t bother. Yes the questions offer another variety, NO they are NOTHING like the re al exam…put out by the same company…the company that publishes the exam. I feel like my boss got ripped off. But hey, it was paid for with company money, nothing out of my pocket. So there ya go. Wikipedia.org – Don’t dismiss this site! 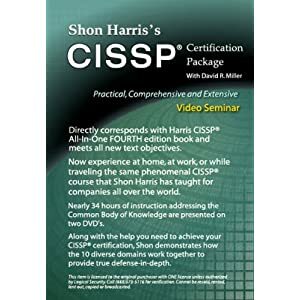 It was a great resource for the OSI model, IP, reserved IP info, and much, much more! It is a quick way to learn about a specific topic, give it a try when you can’t quickly find the answers.